The Conservative government's experiment to pay failed refugee claimants to go home apparently is a roaring success. The Toronto Star reports that as of June, 2,157 people took advantage of Assisted Voluntary Returns and Reintegration [AVRR] three-year pilot program, which aims to short-circuit the laborious and often costly program of removing unsuccessful claimants. And talk about fast: It takes an average 32 days between the time a person registers in the program and when he or she gets on a plane to go home, the Star reported. Under the program, which so far is available only in the Toronto area, failed claimants receive up to $2,000 if they apply before filing a legal appeal of their rejection in the Federal Court. The amount drops the further along a claimant is in the post-rejection process, down to $1,000 if they've exhausted their appeals and received a pre-removal risk assessment. Recipients get a plane ticket home and money delivered in the form of reintegration assistance in the home country that can be put towards education or setting up a business. The program, launched in June 2012, is administered in partnership with the Geneva-based International Organization for Migration (IOM), an intergovernmental group that co-operates on migration issues. Eligibility requirements include compliance with the rules of the refugee-claim process and completion of a new travel document to ensure the journey home goes smoothly. Those who aren't eligible include anyone with even a minor criminal record, someone rejected on national security grounds, organized-crime activity or international rights violations, if the original refugee claim was deemed not credible or if the would-be refugee dropped their claim. 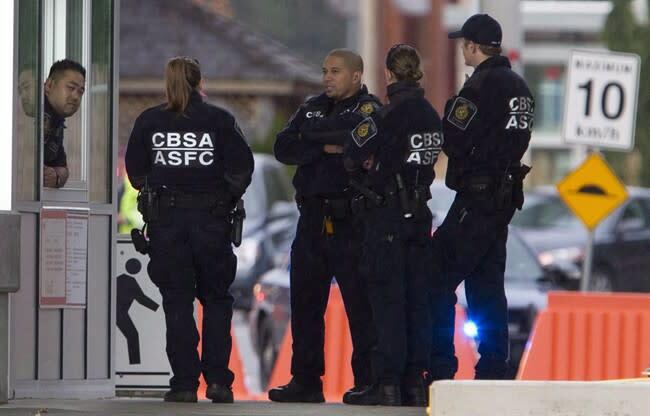 According to the Canada Border Services Agency (CBSA), 38 per cent of the money spent so far has gone to temporary accommodation and 35 per cent to "material assistance," such as buying daily necessities, the Star said. Another 11 per cent went to open businesses and five per cent to education. The money is doled out by local agencies in the claimant's home country. It's not clear from the CBSA or IOM web sites whether failed claimants who take advantage of the program have to promise not to make another claim in the near future. Presumably providing money to help claimants re-establish themselves at home make that less likely. The Star said Hungary, Columbia, Mexico, which have among the highest refugee-claim rejection rates, Croatia and the Czech Republic are the top five countries for claimants using the program so far. Canada accepted 5,412 refugees in 2012, down 26 per cent from the previous year, despite having a 2012 target of 7,500 to 8,000, CBC News reported in March. According to the Human Rights Research and Education Centre at the University of Ottawa, claim-acceptance rates ranged from 40 to 45 per cent from 1989 to 2011, regardless of the number of annual claims (12,000-43,000), though the rate dipped to 38 per cent in 2010 and 2011. The pilot program has been fairly well received by refugee advocates, considering their usually contentious relationship with the government. “For people who are going to return home rather than being shuffled out and dropped at the airport, it makes their return easier with the support,” Janet Dench of the Canadian Council for Refugees told the Star. But immigration lawyer Ron Poulton, assessing the program after a year of operation, wrote on his firm's blog that "much remains unclear about this program specifically what, in concrete terms, an [AVRR] applicant may receive. "The program has been touted as being beneficial for all involved, Canada achieves a high level of removals with reduced cost; the returnees can get assistance in creating sustainable small businesses and the communities to which they return get the benefit of increased economic activity," said Poulton. "The experience in Europe, however, does not support these predictions. Although there are only a limited number of post return studies, they show that there is a very high failure rate among business ventures using reintegration support. "It is presumed that this information will not be provided to applicants at the AVRR interview." Toronto immigration lawyer Michael Nirren also questions the program's approach. "Paying for the trip home for a refugee who fears persecution really just facilitates removals," he told Yahoo! Canada News. "Often they are destitute and can barely make ends meet let alone pay for their trip back. Nirren said many failed refugees still fear returning to their homes and $2,000 is not much consolation for those who really wanted to stay here. "I think the public can see though this one. This is no humanitarian gesture on the part of the government," he said. Ottawa has set a target of 6,955 voluntary returns during the three-year pilot program, the Star said. Its performance would be reviewed to decide whether it's cost-effective and efficient but is expected to be renewed, and presumably expanded country-wide.